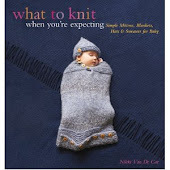 What To Knit When You're Expecting: So What DO You Knit When You're Expecting? So What DO You Knit When You're Expecting? At the moment, you knit a kicky-young-mama-in-the-Springtime shawl. The nesting urge can wait a week or two. Fountain Pen Shawl by Susan Lawrence, from Spring 2009 Interweave. The yarn is Cascade Alpaca Lace, purchased from (sniff!) The Point, on the advice of my friend Mary, who thinks I need to wear more purple. The nupps, they are killing me. I love my Lantern Moons, but their tips are not made for nupp-making. And since this is the project I took with me to Hawaii, I didn't have any other needles to switch to--and really, I don't think even Addi Laces would really help matters. I've decided to cheat--I'm making smaller nupps. One yarnover, and that's it. It looks fine, and I just couldn't take it anymore. 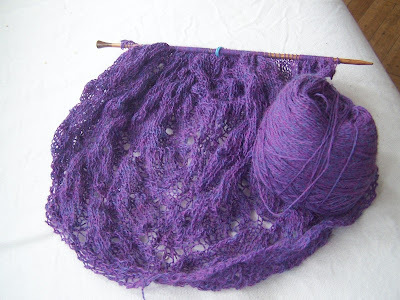 Other than that, the shawl is delightful to knit, and I think I'm mostly mistake-free. 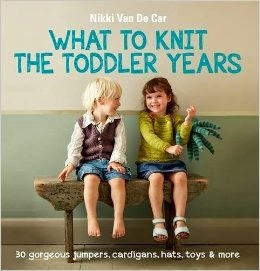 You would think--or anyway I would think--that I would be more interested in knitting baby things. And I am--I am queueing away, for sure. But I don't feel like I know this baby yet. There's no evidence of baby in there beyond the queasiness and the heaviness and the tiredness; it's really just me feeling all of that. Little Roo has yet to make his presence known. And so--I knit for me, for now anyway. I think you should knit complex, lacy things for yourself before pregnancy brain sets in (and before you only have baby clothes on your mind)! Maybe you'll be one of the lucky moms that manages to avoid the brain-drain -- who knows? I got it bad, and it took a long time for my powers of concentration and short-term memory to return. Let me know if you want to borrow some super-pointy needles or blocking wires, ok? I love that shawl, but I don't think I have the knitting chops for it. HAPPY FIRST EVER MOTHER'S DAY! AFTER ALL, THERE'S A BABY ON THE WAY!